The work of our brains is beyond incredible. And its design, and how it evolved, continues to be hard for me to wrap my arms around. Just one example is our reward system. Without it, we don’t exist. With it, we have to remain aware of the trap potential. Let’s open the door…. It’s pretty common knowledge that our reward system is a huge factor in substance use disorders. But what escapes the headlines is its role in any impulse control situation: overeating, problem gambling, excessive internet use, hypersexual behavior, explosive rage, and more. And, of course, it can be a player in the generation of mood and anxiety misery. I find the reward system fascinating and relevant to what we do here on Chipur. And I think you will too. What Is the Reward System? The reward system is a gathering of brain structures and neural pathways that are responsible for major cognitive functions such as behavior learning through association (classical conditioning), behavior learning through reward and punishment (operant conditioning), motivation and craving for a reward, and positive emotions – especially those involved with pleasure. By design, the reward system is about survival behaviors – reproduction, eating, socializing, physical defense. There are numerous pieces of anatomy that make the reward system roll. You can see some of them in the image. 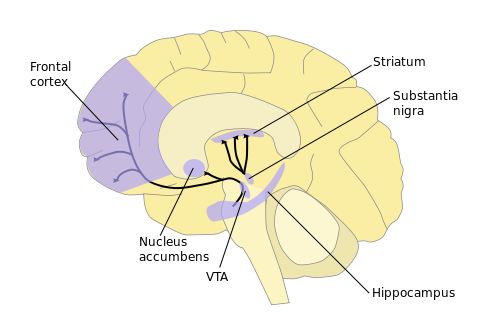 However, the heavy-hitters are the nucleus accumbens (NA) and the ventral tegmental area (VTA). Now, the power-line, if you will, of our reward system is the medial forebrain bundle (MFB). It’s the MFB, a neural pathway, that transmits signals from the VTA to the NA. Makes sense that the MFB is frequently referred to as the “hedonic highway.” And when it’s blocked the longing for, we’ll use drugs of abuse (DOA) for our discussion, is greatly reduced or downright ceases. The signals that pass through the MFB are supported by dopaminergic (dopamine releasing) neurons. Generally speaking, drugs that are not abused have no effect on dopaminergic concentrations. Getting into all of the reward system’s physiology would exhaust the both of us. So we’re going to fast-forward to the appearance of the inhibitory neurotransmitter, gamma-aminobutyric acid (GABA). DOA act upon GABA receptors, which leads to neurons being inhibited from firing. And that results in the release of less GABA onto dopaminergic neurons. When that happens, a disinhibition of dopaminergic neurons occurs, which makes them fire more rapidly – releasing more dopamine into our reward system. And wouldn’t you know it, higher dopamine concentrations result in feelings of well-being, even euphoria. So the “buzz” is on. Interestingly enough, it’s through GABAs interaction with limbic system structures – the amygdala, hippocampus, hypothalamus, thalamus, cingulate gyrus, etc. – that we experience anxiety reduction, sedation, and behavioral disinhibition. So, in fact, the components of the brain that generate anxiety-reducing effects are, let’s say, an extension of the reward system. Bottom-line, outside “substances” (DOA, food, the internet, and more) gain entry into our bodies and use our reward system to fulfill their mission. And it quickly becomes a reciprocating relationship. Our reward system ends up needing the substance, just as the substance needs our reward system. And as it so often goes, the substance commandeers the reward system. And addiction is accomplished. In prep for this piece I came upon a great article on Psychology Today’s site by Dr. Amy Banks, co-author of Four Ways to Click: Rewire Your Brain for Stronger, More Rewarding Relationships. I’ll slip you a link to her piece at the end. She answers the question by recalling B.F. Skinner’s operant conditioning work in the 1950s. Scientists put electrodes into the limbic system (emotional center) of rat’s brains and gave them a small zap when the rat entered a specific corner of a box. Everyone thought if the shock was unpleasant enough it would cause the rat to keep away from the corner. Hmmm, but something unexpected occurred. When the electrode was placed in the nucleus accumbens (NA), instead of avoiding the corner, the rats went back to get the shock time and again. As in 700 times in an hour. They even chose a shock over food. Banks points-out the behavior was something the rats absolutely “needed” to do. 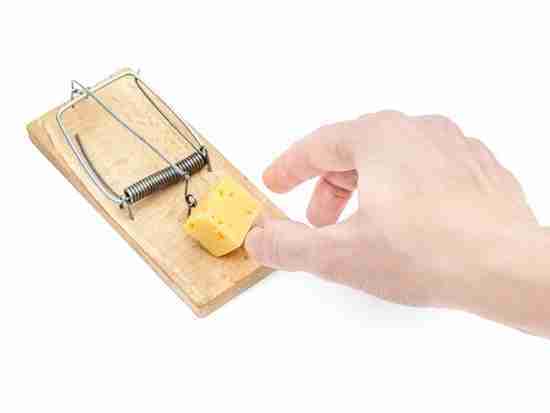 The increase in motivation and energy that dopamine provides can be a good thing, but when your brain gets wired to compulsive behaviors that stimulate the dopamine reward pathway (addictions) then your life can be as out of control as the poor rat in Skinner’s Box. Banks believes dopamine, nor the reward system, are the problems. No, the problem is how we stimulate the dopamine pathway. This disconnection is a set-up for addiction as we search for other sources of dopamine. The ‘other sources’ look shockingly similar to the list of common cultural complaints – overeating and obesity, drug and alcohol abuse, consumerism, chronic hooking up. Not only do these addictive, destructive behaviors get paired to the dopamine reward system but they create a feedback loop of isolation that pushes people towards more addictions. Without healthy relationships we each become like the rats in Skinner’s Box – seeking dopamine from all the wrong places. It is time to rewire our brains for the healthy relationships and connections that reward us with positive energy and motivation. Our reward system and dopamine: absolutely stunning design and work. But as incredible and life-sustaining as they are, can you see the trap potential? I’ve always needed to know the anatomy and physiology behind my emotional and mental challenges. Understanding has always provided me with healing direction, and that’s a huge component of hope. If you’re struggling with impulsive behaviors, even with a mood or anxiety situation, what you just read had to have hit home. Please check-out Dr. Banks’ article, The Dopamine Reward System: Friend or Foe? Plenty more Chipur articles are waiting for you. Why not check-out the titles? Next Post: Derealization & Depersonalization: What Is This Horror? Can It Go Away? Previous Post: Our Teens & School Mass Shootings: Where Have We Gone Wrong?